After we got back from New York and Arnold’s pacemaker adventure, he dutifully reported to his cardiologist here, who had everything checked out. The marcapasos (pacemaker) is doing just fine, but mysteriously, Arnold’s heart is still not working as efficiently as it should. The doctor said “We need to find out what’s going on” as he suspects a blockage or blockages in his coronary plumbing somewhere. So off he went this week to the regional nuclear medicine center, PET Guadalajara, to have a PET scan done. With those images, the doctor can tell us where we need to go from here. Arnold is of course sick of the whole thing and is not happy at all about his new identity as a cardiac patient. Nor am I, but as we keep saying, we don’t really want to consider the alternative. Whatever they figure out, it may well involve more surgery and probably a trip back to the States, where Medicare thankfully will cover much of the expense. So for the moment, we are putting things on hold until we know what he will be facing. More uncertainty, alas. Since all of the local websites have pretty much shut down any talk of crime (some of them being sponsored by local real estate agencies, of course), many people are happy that things appear to be calmer now after the horrible spate of random kidnappings and murders we had last month. People are slowly creeping out of their houses and resuming their habitual routines. The streets are no longer deserted; there are fiestas resuming on the weekends and expat community leaders are urging everyone to start patronizing local restaurants and businesses again. There is much musing about the best ways to help our Mexican neighbors recover from the recent crime wave by sending some pesos their way, from “Get out and eat at the restaurants” to “Donate to the funds we have set up for victims’ families”. Whether it really IS any safer out there now, who can tell? Most of the expats around here don’t read Spanish well enough to check the Guadalajara metropolitan dailies; but sadly, even a superficial glance at those will tell you that there is more than enough crime to go around. But if it’s true – as they say – that after the elections things may calm down, perhaps it won’t be all that much worse than what you’d read about in Detroit, or Chicago, or insert-name-of-crime-ridden OTHER city of seven or eight million people. Who knows? But undeniably, the rival gangs are still kidnapping and extorting and robbing and murdering out there. The unspoken question always hanging above our heads, like one of those cloud comic book balloons, is whether our little expat colony persists in living in a dreamworld convincing itself that they will continue to leave us alone. But in fact, thus far – unless someone got themselves mixed up in the drug scene somehow – they have. Or, as has happened to an unfortunate few, you are in the wrong place at the wrong time. But then I always come back to the crazies that slaughter people in beauty parlors or malls or wherever back in the States. In this day and age, how you meet your maker seems to be increasingly random – and now I am beginning to suspect that with the economies of much of the world collapsing or going through, at the very least, very tough times, it’s going to get shakier and more unpredictable everywhere. People are getting killed all over the place. I could change my tune tomorrow if there is a resurgence of random violence in our village, but right now I’m thinking that one might as well stay in a place where you have flowers and hummingbirds to distract you all year round, your house is your own, not some crooked bank’s, and the coldest it gets makes you put on socks and a sweater. You don’t have to be reading the morning news to be a nervous wreck, however. Cartels and American psychopaths aside, Arnold is also balancing on the edge of a knife blade just because of what is going on inside his own body – no murderous thug need apply to give him sleepless nights. So we are putting our fretting about being massacred in a balacera (gun battle) aside long enough to try to figure out what we are going to do about Arnold’s heart situation and – to the extent that anyone can relax knowing that they may be facing heart surgery – to enjoy the arrival of the rainy season. Everything is turning lush and green, almost overnight, as it does every year. We were sitting on our terrace the other day, watching not only dozens of hummingbirds racing around, but the big yellow-and-white Great Kiskadees (they call them Kiris here) with the wonderful black racing stripes on their heads, some gorgeous orange, yellow and black orioles, and a couple of brilliant red Vermillion Flycatchers swooping around our fountain. Then suddenly we heard the remnants of a procession passing by the house in the street outside our garden walls, accompanied by the strangest and most compelling sort of pre-hispanic or medieval melody you can imagine; I thought it sounded like a flute but I’m still not sure. I’d never heard anything quite like it. They’ve been setting off cohetes (rockets) all over town, too, scaring pets and rattling everyone’s nerves even more than they have been rattled by recent events. But cohetes are a big part of the culture here, so their return wasn’t entirely unwelcome; a tenacious tradition reasserting itself in spite of it being a dangerous time. The unearthly music floated around the neighborhood for quite awhile, and whoever was playing it was either in a trance or practicing very hard to get it right, because it was repeated over and over again, almost like a meditation. The street had been decorated with red and white crepe paper, too. “It’s got to be some sort of religious holiday, doesn’t it?” Arnold said. “Yeah, but which one is it?” I wondered. Then it dawned on both of us, when we remembered the June date, and that the red stood for blood, the white for purity, that it was Dia del Sagrado Corazón, Day of the Sacred Heart. It is a actually a very serious holiday for these folks, marked by somber prayers and processions, acts of consecration, the recital of novenas and so forth. It is probably going to turn out, when we see the doctor, that it will have been a pretty serious holiday for us, too. Prayers for us, for those who pray, may well be in order, in fact. One sees a variety of images of hearts – both sacred and profane – everywhere in Mexican art, from the pierced and bleeding hearts (symbolizing the travails of the Mexican people) of the great muralists to the most naïve and delightful folk art. Even Arnold’s cardiologist, whose black-and-white office is as sleek and modern a place as you can possibly imagine, in an equally sleek and modern glass tower in Guadalajara, has a wonderful handmade metal tree on the credenza behind his desk – hung with dozens of enchanting, translucent red glass hearts. So while he is telling you that you need to have your chest cut open and your heart patched up, you can enjoy this wonderful piece of folk art. Mexico has come a long way since the day when, instead, they would have cut your heart out and offered it up to the gods as a sacrifice. And so, still waiting for the results of Arnold’s twenty-first century PET scan, we have passed this year’s Día del Sagrado Corazón. 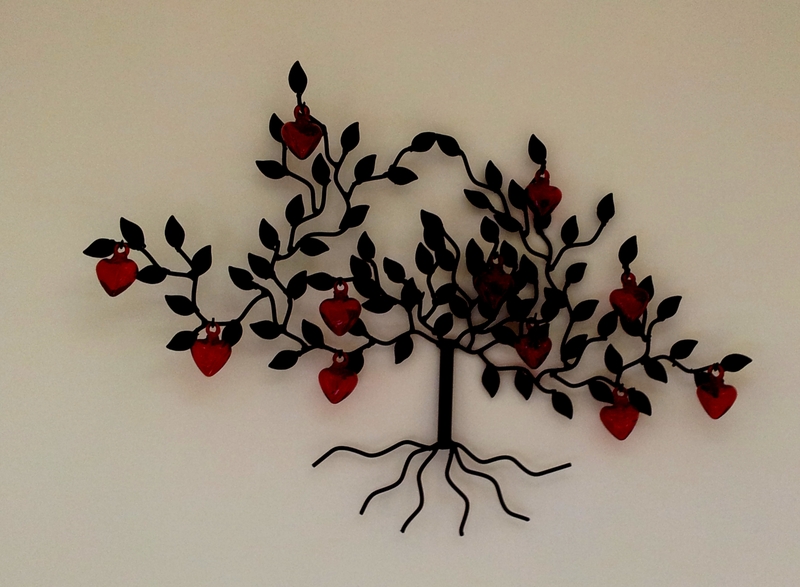 We will see the cardiologist, and his delightful metal tree, in this office this afternoon.